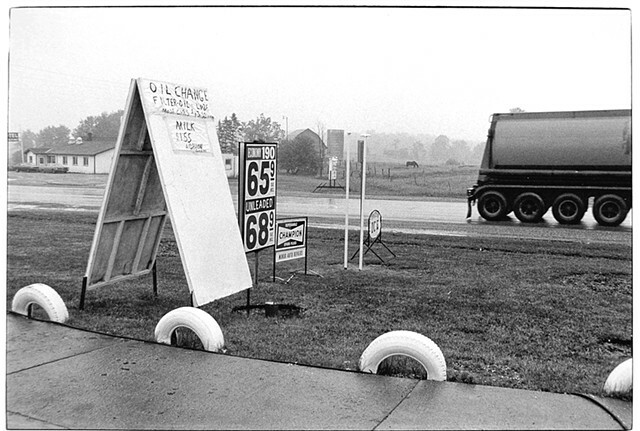 Fordham University is proud to present David Freund: Gas Stop, a sampling of twenty-seven black & white photographs pulled from a much larger investigation made between 1978 to 1981. In the twentieth century any American driver or passenger would likely stop at a gas station weekly, not just for gas. Then, gas stations were also oases offering food and drink, car repairs, directions, telephones, maps and, importantly, bathrooms. Yet, beyond appreciation as architectural novelties, they and their offerings have been little photographed. From 1978 to 1981, David Freund looked at the culture, architecture and landscape of gas stations in more than forty states. The photographs show customers and workers interacting, gassing up, or just hanging out. Architecture and signage, both corporate and vernacular, reach out to passing drivers. Gas Stop presents the designed or natural landscaping seen at stations, and the regional landscapes that hold and surround them. Sparking recognition and recollection, the photographs, accrue as elements in a nonlinear narrative of automotive America. Of more than 200,000 gas stations in the United States at the time of his project, today about half are gone, especially full service ones. Such stations and their offerings exist now mostly in memory and in this work. On the first morning of an intended photographic project, outside of my motel was a gas station from which I photographed a dark and rolling tanker truck as its four black tires passed a line of four half-buried white tires. In the misty distance was a grazing horse, framed by the back of the truck. In front of the station was a large, hand-lettered sign advertising milk, and across the road a small, local motel. As someone later commented, “These are about everything." The painter Miles Forst once described gas stations as a place to go to fill up your tank and shut off your brain. That morning, however, I became aware of gas stations as a locus for many elements that characterize America. And whether stopping in or hanging out, people in motion are often around to enliven and propel the narrative.